Ted Ross a former purser with Canadian Pacific Steamships Ltd and later based in their office on the 1st floor of the Bund 27 building in Shanghai. Ted volunteered as a Red Cross ambulance driver when the Japanese attacked in 1937. 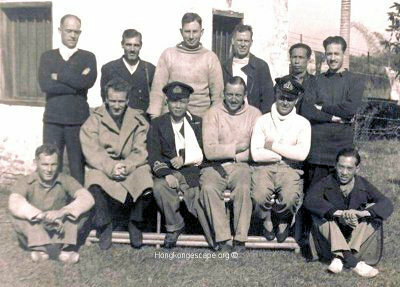 Ted was a keen sportsman and rowed successfully for the Shanghai rowing club, as did Sub-Lt Legge HKRNVR. Ted was posted to Hong Kong after four years in Shanghai where David MacDougall recruited him as his assistant in the "Ministry of Information". During the battle for Hong Kong Ted and his boss David MacDougall were fully employed countering the Japanese propaganda within the Colony. Ted Ross MoI : "There were an estimated million and a half Chinese (civil population) on the Island, in addition to approximately twenty-five thousand Europeans, mostly British. Our job was to keep them informed of the military position. To that end we had to see to it, as far as possible, that all English and Chinese newspapers kept publishing. We made three trips a day up to Battle Headquarters for official communiqués. These were passed to the Press, in addition to a multitude of notices that were required to be promulgated as necessity arose. These notices covered everything from warnings not to drink water unless it was boiled first, to appeals for warm clothing for Kowloon evacuees; and from instructions covering air raid precautions to appeals to the populace to remain calm and not to listen to rumours and scaremongering." The Ministry of Information (MoI) was set up to maintain public morale through the use of publicity and propaganda via the media. Home intelligence was a department within the MoI used to observe and monitor the public mood, gathering intelligence from the likes of shop keepers, publicans, clergymen, shop stewards, as well as G.Ps, letter opening and phone tapping. The MoI also produced propaganda films for public showing. From Shaoguan (Kukong) members of the Aberdeen Island escape party were flown to Chungking for debriefing. The arrival of Cmdr Hugh Montague RN (Rtrd), Police Supt Bill Robinson of the Indian Police Intelligence unit, Captain Peter Macmillan, Captain Reginald (Freddie) Guest, Sq-Ldr Max Oxford, all staff officers of HKBHQ, David MacDougall, and Edwin (Ted) Ross both of the Ministry of Information arrival in the early hours made the British national and regional press the same day 15th January 1942. Ted supplied a detailed account of the events in Hong Kong and subsequent escape. 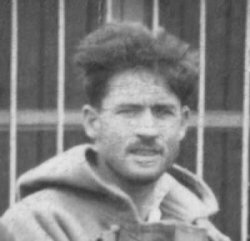 Ted Ross MOI: "Well, we hadn't gone much more than five or six hundred yards when we were spotted from the shore and the Jap's let fly at us with everything they had, rifles, machine guns and small shells. 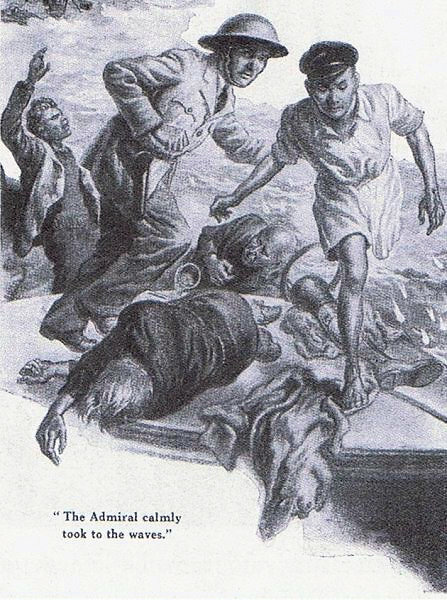 Several of our chaps were hit, and soon a shot put the engine out of commission, that capped it. 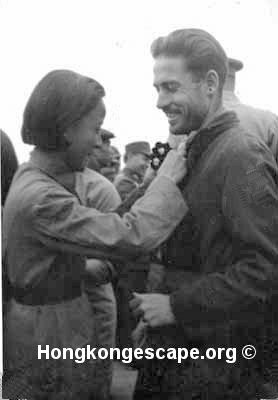 Arriving in Shaoguan (Kukong) on 6th January 1942 where the local Girl Guides pinned HERO rosettes to our lapels. Ted retired to Australia in the 1970's to farm cattle, survived by his son Warwick Ross who is a vigneron at the "Portsea Estate"
Ted was a keen sportsman, rowing for the Shanghai rowing club, as did fellow escapee Sub-Lt Legge HKRNVR. They were both in teams that beat the Germans in their seperate dicaplins in 1936/37. Ted's son Warwick discussing his film project.